After descending Val d’Iragna, Eric and I stop by it’s next door neighbor to check out the level of water flow at the bottom of Val Lodrino. Lodrino is a big drainage and does not have a hydroelectric dam controlling its flow. It exists in its natural state. Before we could see the water we could hear its power. Those sounds create an immediate emotional response of anxiety and wonder. When we see the final waterfall we compare it to the photographs in our guidebook, “Eldorado Ticino” by Luca and Anna Nizzola. They are in fact high, very high. The recent rain has not yet run its course through Lodrino. Eric and I have serious doubts if descending this canyon and all of its technical challenges is in the cards for us at these levels. Back at the parking lot we run into nearly a dozen canyoneers who are sleeping on the black top under the bright sun. They look like they are right out of a Red Bull commercial. We speak with the one guy who is awake, filming his friends snoozing with a GoPro camera. They are Brits who reside in Switzerland. They have just come down Lodrino. We ask about the flows. “Flows are good,” says the man with a sizable scar across his face. He then qualifies, “It could get dicey if you don’t jump everything.” Referring to the dangers of rappelling and hydraulics in big flow. With only a few days left before returning to the States a descent of Lodrino now seems unlikely. Not wanting to give up on the possibility of a descent, we return to the checkpoint of Lodrino. Water levels are perhaps slightly lower but still high. The following day would be our last chance. After some discussion we green light it. We are not alone at the staging area at a cemetery on the outskirts of the small village of Lodrino. A half dozen other groups are getting ready. Some appear to be guided. Others are canyoneering teams wearing matching clothes. Group by group they slam the sliding doors of their vans adorned with what appears to be sponsorship signage as they are shuttled to near the top of the route. No matching jump suits or car shuttles for us. We attack the mountainside on an easy to follow trail through a dark forest. When we stop to catch our breath we get magnificent views through the trees of the Riviera valley below illuminated in the morning sun. We can see the side canyons of Cresciano Boggera and Osogna Nala across the Riviera that we descended earlier in the week. At the start of Val Lodrino intermedio we suit up. I am both nervous and excited. We say goodbye to Laura who decides to sit this one out. The first obstacle is a fairly straightforward jump over a powerful hydraulic. Eric jumps first without his pack. I toss his bag from above but not far enough to get past the hydraulic. It gets sucked in. After I jump down to join Eric with my bag on, I realize the potential seriousness of my mistake. Eric dives into the hydraulic, fishes out his bag and then has to swim like hell to get out. I breathe a sigh of relief when he and his bag come through. It would not be the last of our hiccups of the day. Moving on we encounter a few more jumps and slides before reaching a powerful 160-foot waterfall rappel. At the bottom I can see Laura waving from atop a bridge that spans the canyon hundreds of feet above. She is very small. From here the canyon gets hauntingly deep and dark. We encounter a half dozen obstacles before a surprising long section of river walking. The canyon then narrows again into the famous Val Lodrino inferiore. The power of the water has seemed to eliminate all hard angles in the rock. The deep saturated bluish-green of the water throws a cool cast on the tubular space that exists between the silver, polished rock. The obstacles are continuous and challenging. We are feeling a deep connectivity to this rock, water and space and the moves required to fluidly achieve the obstacles. Eric and I alternate leading. The intensity of the flow requires total concentration. I am existing in a deeply spiritual place. 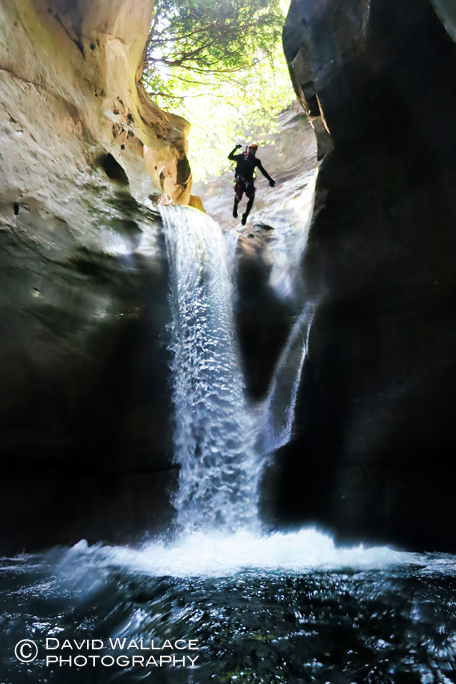 We reach a 20- foot drop that requires either a traverse along a ledge before jumping in the pool below or a rappel in a very tight channel where all of the water is funneled. We opt to rappel. I watch Eric as he makes his way down while being pounded by the current. Half way down his upper body disappears into the white water. I can still see his legs below him but he has stopped descending. He appears to be struggling. I am unsure of what to do. He is not signaling for me to lower him but I wonder if he is unable to to locate his whistle as the waterfall is blowing him up. My mind is racing. After what seems like minutes, but was probably no more than 30 seconds I see Eric’s red backpack come flying out of the current and disappear into the canyon below. I then watch Eric make his way down the remainder of the rappel. Not wanting to follow in his footsteps I pull up the rope, bag it, make the traverse along the ledge and jump into the pool below. 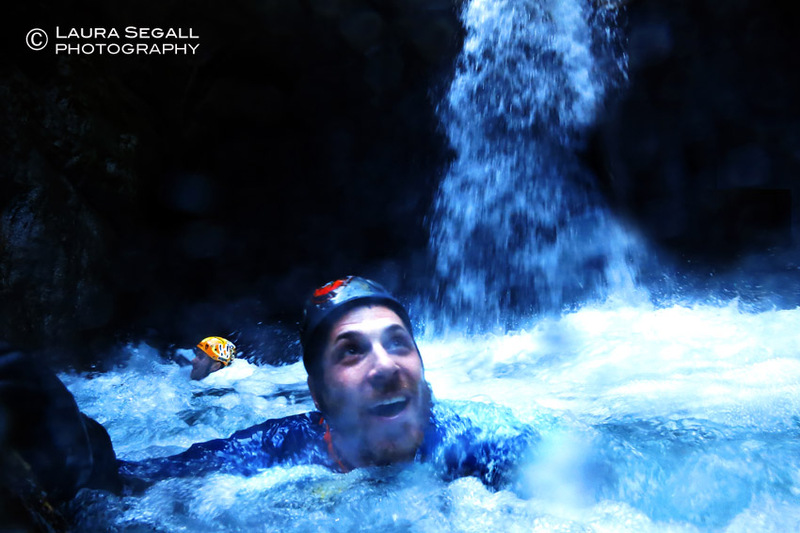 I swim down canyon between narrow walls to Eric standing over a 150- foot waterfall with a concerned look on his face. When I stand right next to him (which is required to verbally communicate in the deafening roar of the water) he tells me that his bag got swept over the 150- foot waterfall after he had to remove it off his back after becoming pinned by the current on the previous rappel. We now have a potential problem as one of our two ropes is in Eric’s bag somewhere down canyon. With my rope we can rappel down the 150- foot drop, but without the second rope we will not be able to pull and recover our rope after the rappel. If Eric’s bag got swept down a second drop where a rope will be necessary than we will be lampooned in the canyon. Eric seems confident that it is relatively flat at the bottom of the drop and with a little luck that red bag will be waiting for us in the pool below. With my nerves getting the better of me I am not so sure. Our plan… I will rappel down, search for Eric’s bag, after hopefully finding the bag, attach the rope bag to our rappel rope, signal four whistle blasts letting Eric know he can haul the rope bag up. I make my way down the rappel scanning below from the bird’s eye view for anything red against all of the grays and blues. Suddenly, with 30-feet to go it dawns on me that I better stop and check to make sure that there is enough rope below. When I stop there is only three feet of rope below my right hand. Yikes, kind of a close call. I whistle signal to Eric to lower me the rest of the way. Upon touch down I aggressively begin searching. I make a quick look left and right of the tennis court sized pool and see nothing. I then venture downstream 50 meters and realize there is no chance that the bag got swept down a second drop. This is a relief and it is just a matter of sniffing her out. Not finding the bag I return to the pool for a more thorough examination. I swim along the entire shoreline, in some places fighting against the current, systematically searching every nook and cranny. In the final corner I find the bag amongst driftwood hidden in a crevice. I am elated. I swim back to the rappel rope, attach the rope bag and then signal four whistle blasts between heavy breaths. Eric spends the next 20 minutes hauling the saturated 220- foot rope back back up against the current of the powerful 150- foot waterfall. A few more rappels including one that drops through a massive granite arch concludes the canyon. We are exhausted and all smiles as we reunite with Laura waiting for us at the bottom. In the morning we will fly out of Milan’s Malpensa International Airport but we don’t want this adventure to end. Before the two hour drive to Milan, we stop in downtown Bellinzona to attend the Grape Harvest Festival. The town square is filled with several thousand people eating regional cuisine, drinking the local Merlot and reveling in the festivities. The centerpiece is a stage set up along the steps of the church with traditional music, dance and costume. A row of five, 6- foot long wooden horns known as Alphorns herald the celebration. It starts to get dark and we realize it is our time to say goodbye. These nearly two weeks were over in a blink of an eye. It was an adventure that tantalized all of our senses. We left full with experiences and memories, leaving nothing behind and feeling very fortunate. The village of Lodrino as we start the hike up the mountainside for our descent down Val Lodrino. Laura on the hike up to Val Lodrino. Across the way (background) you can see Osogna Nala canyon that we descended the previous day. 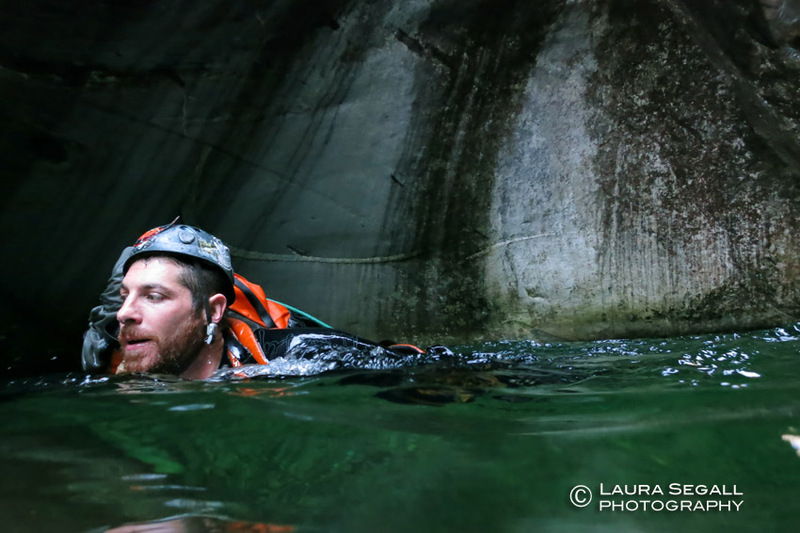 Eric swims out of a hydraulic in Val Lodrino intermedio. 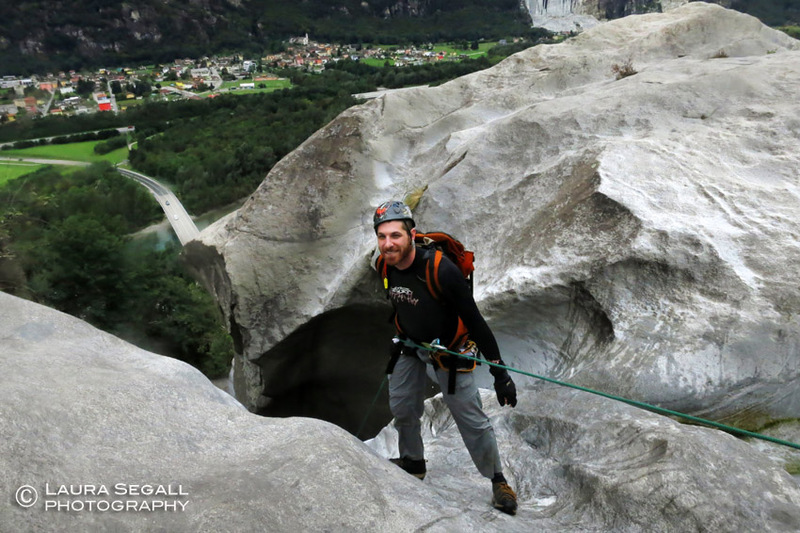 Eric rappels down 160- feet in Val Lodrino intermedio. Eric looks on in Val Lodrino intermedio. 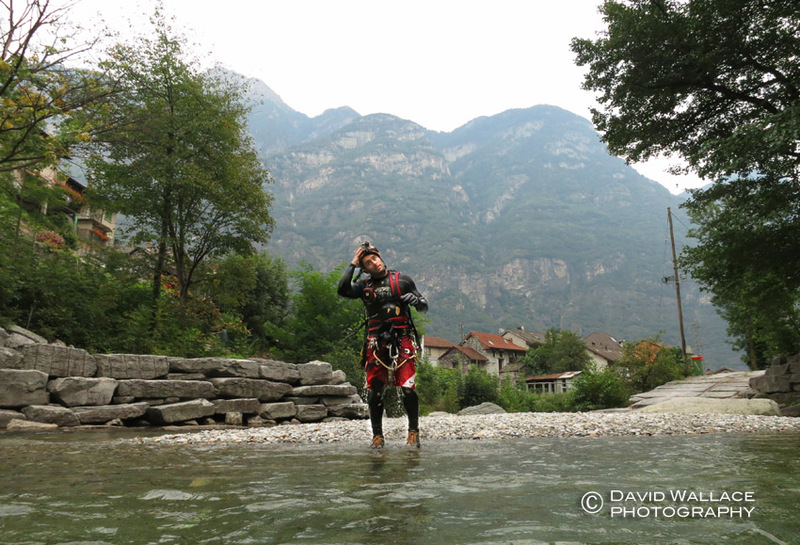 Eric stems over water in Val Lodrino inferiore. Eric in Val Lodrino inferiore. Eric negotiates in Val Lodrino inferiore. Eric jumps in Val Lodrino inferiore. Eric wades in Val Lodrino inferiore. 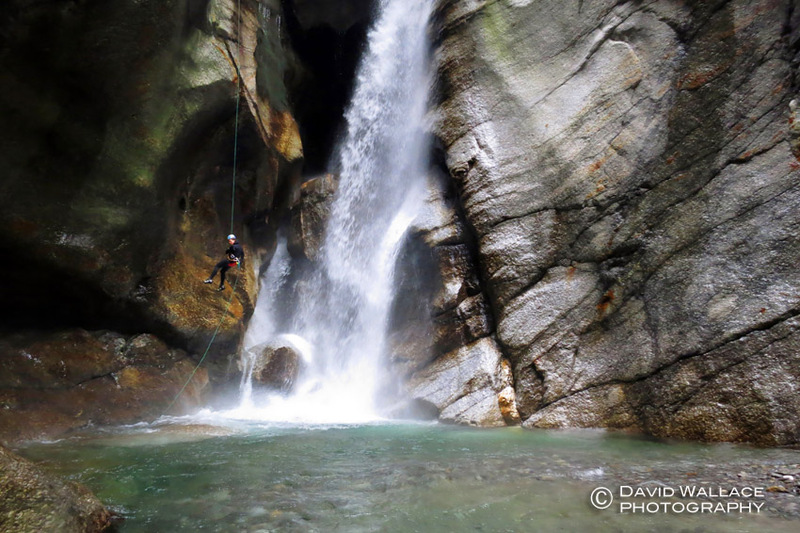 Eric rappels in Val Lodrino inferiore. David and Eric at the end of Val Lodrino inferiore. 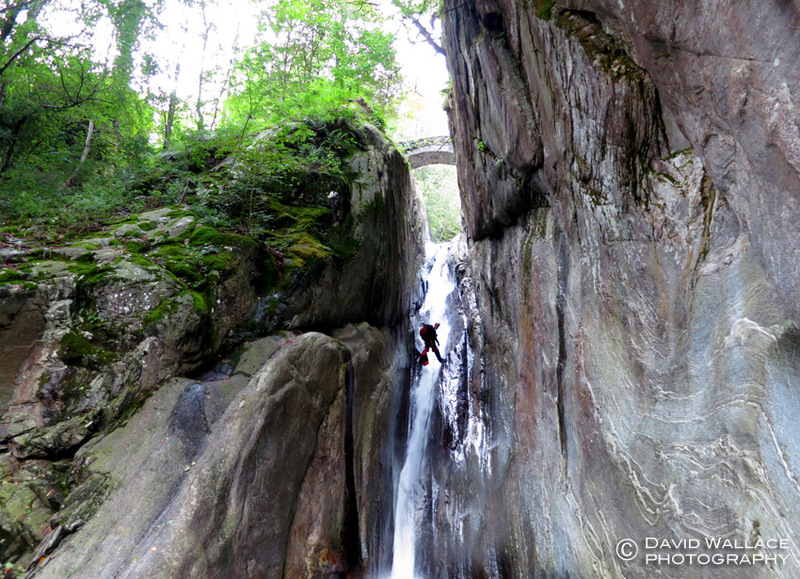 A rappel through an arch at the end of Val Lodrino inferiore. 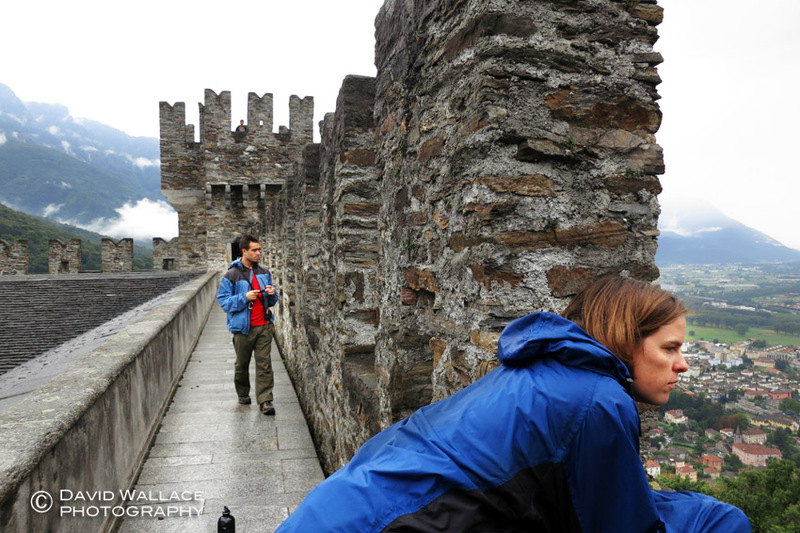 Castles wall surround your everyday municipal parking lot in downtown Bellinzona. Grape Fesival in downtown Bellinzona. 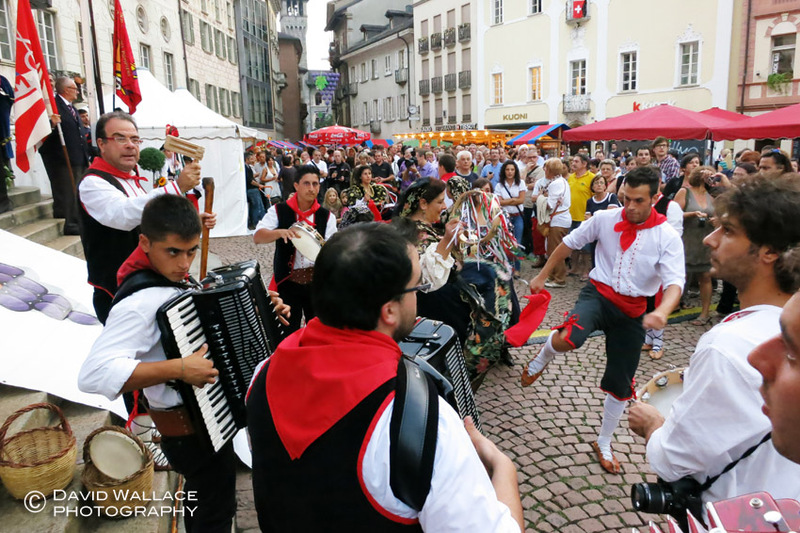 Traditional song and dance at the Grape Festival in downtown Bellinzona. Flying over the Swiss Alps on the way home. We are staying at the Curzútt, a hostel in the middle of a hamlet that dates back over 800- years. Buildings hundreds of years old still stand today. The hostel has been restored consistently with this architectural history as layers of stone have been chiseled and perfectly placed with a minimal use of mortar. The settlement is over 1300 feet above the valley floor. The final quarter mile and 500- feet of vertical must be covered either by foot or cable car. Our day begins with this walk down the steep switchback path to our car. We drive up into the Blenio Valley for today’s adventure, a technical descent of Pontirone Lesgiüna inferiore. Where the road crosses the bottom of the drainage we peek into the canyon to check the water levels. It looks like big flows. We hike up through a chestnut tree forest. We leave the woods behind and descend into the canyon bottom down a steep and exposed slope. A fixed hand line assists in one particularly spicy section. We suit up having to shout to be heard over the deafening noise of the cascading water. Below the first rappel, the canyon narrows into a dark abyss. It is a big waterfall. 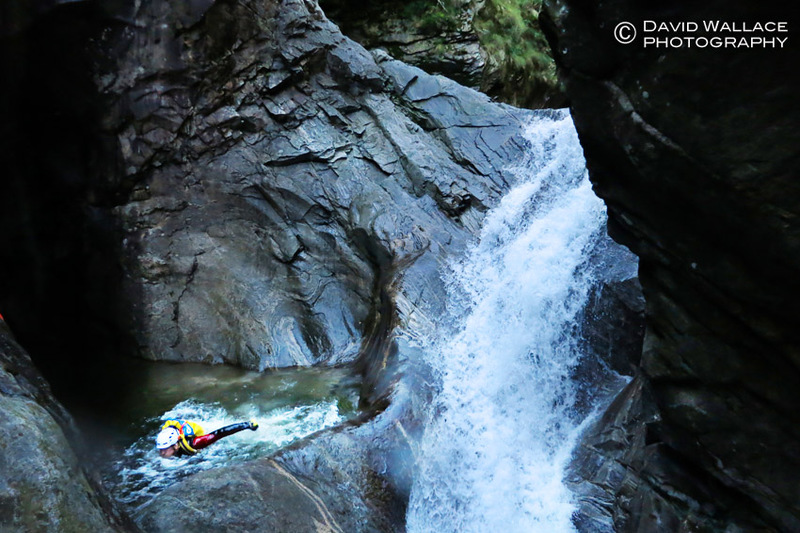 From our guidebook, “Eldorado Ticino” by Luca and Anna Nizzola, we know it is 140- feet. The anchor off to one side of the canyon wall keeps us just outside the reach of the main flow, but close enough for us to feel its raw power. Eric perfectly describes it as the “dragon’s breath”. Having experienced well over a 1000 rappels this one is memorable. From here the beauty of the canyon takes off, narrow polished silver walls and emerald green water. Thanks to its skinniness, the technical obstacles keep pace with its stunning aesthetics. This canyon is far narrower than any of our previous European descents. It’s tightness more closely resembles the canyons of Zion National Park or the Mogollon Rim of Arizona. Throw into the mix what could have been 50 CFS of water. It is a recipe for powerful hydraulics at the bottom of the numerous drops we encounter. These hydraulics require that rope lengths are set short or that jumping replaces rappelling to ensure we are not sucked into these whirlpools. A fixed traverse line assists in getting us to a safer launching zone for a jump. Another drop is negotiated by down climbing and crossing underneath the water flow that shoots out horizontally in a jet stream. More jumps and rappels require the utmost attention to detail on rope work. After a final 50- yard swim through a narrow hallway of churning water the canyon ends under two bridges. We are buzzing from this truly special descent. 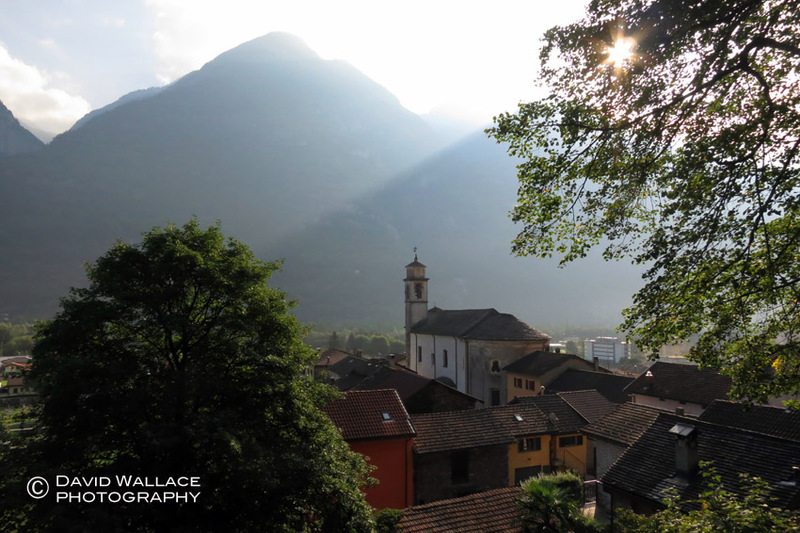 With plenty of day left we drive back down the Riviera, past Bellinzona and Locarno to the small town of Brissago on the shore of the massive Lake Maggiore, where we take the next ferry to Brissago Island. The six acre island in the middle of Lake Maggiore surrounded by the Italian and Swiss Alps is home to a stunning open air botanical garden. Ticino’s warm sunny climate allows sub-tropical plants to thrive on the island. The garden houses 1700 plant species from around the world including, lotus blossoms, giant sequoias, bald cypresses, perennial banana plants, bamboo and eucalyptus trees. We spend the afternoon wandering between every corner and pocket of the island exploring the diverse vegetation and rocky beaches to the backdrop of this massive lake and towering mountains beyond. A ferry back to the mainland, beer and pizza for dinner and the hike back up to the Curzútt Hostel close out the day. Laura uses a fixed hand line during the steep hike into Pontirone Lesgiüna inferiore. Laura rappels over and down an enormous boulder. Laura makes her way down massive water on a 140- foot rappel. Eric negotiates a tricky technical jump. Laura traverses a fixed line to a rappel. Eric down climbs under and behind a waterfall. Eric in some impressive narrows. Eric and Laura make their way to the end of Pontirone Lesgiüna inferiore. The Curzútt Hostel where we stayed for three nights. 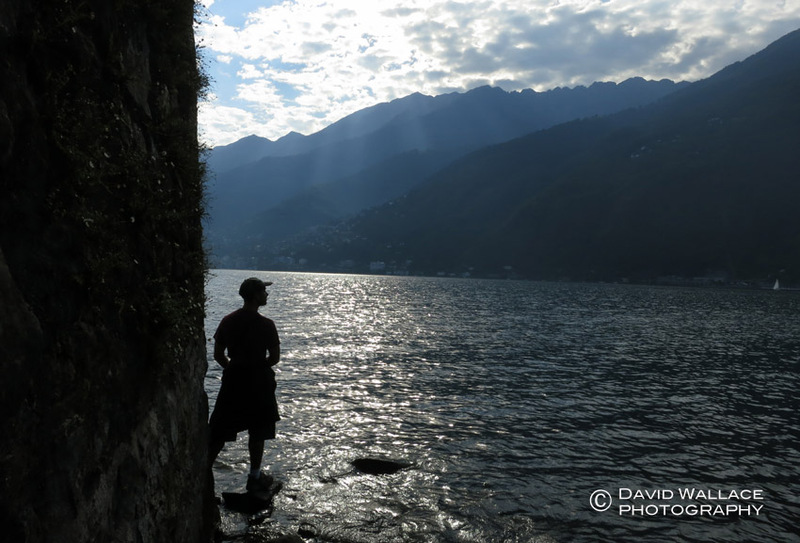 Eric looks out from Brissago Island onto Lake Maggiore. Flowers at the Botanical Gardens at Brissago Island. Botanical Gardens at Brissago Island. The shore of Brissago Island. 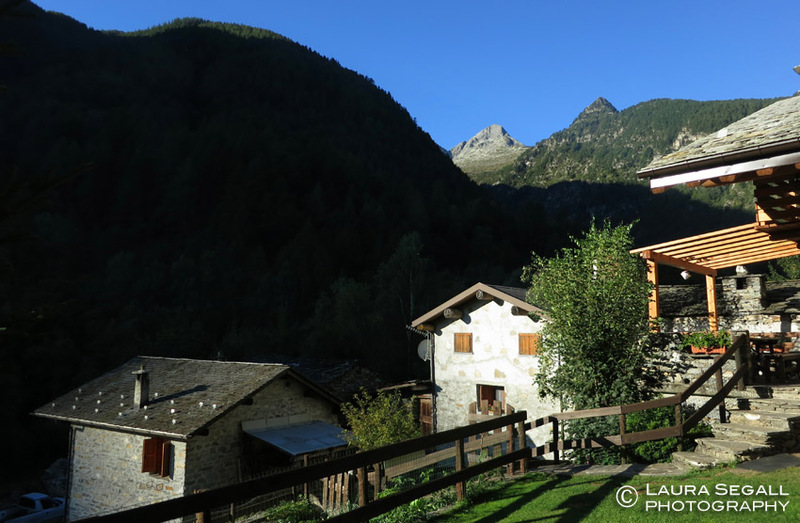 We awake on a chilly morning in a campground high up in the Valle Leventina, not far from the trailhead for a two day trek taking us out of the valleys and high up into the Lepontine Alps. Before the trek we warm our bones at the campground restaurant with espresso and freshly baked pastries. The hike begins in a verdant field past cows creating a symphony with their cowbells. The sun is finally out in full force. The air is crisp and vibrant. The blues and greens saturated. 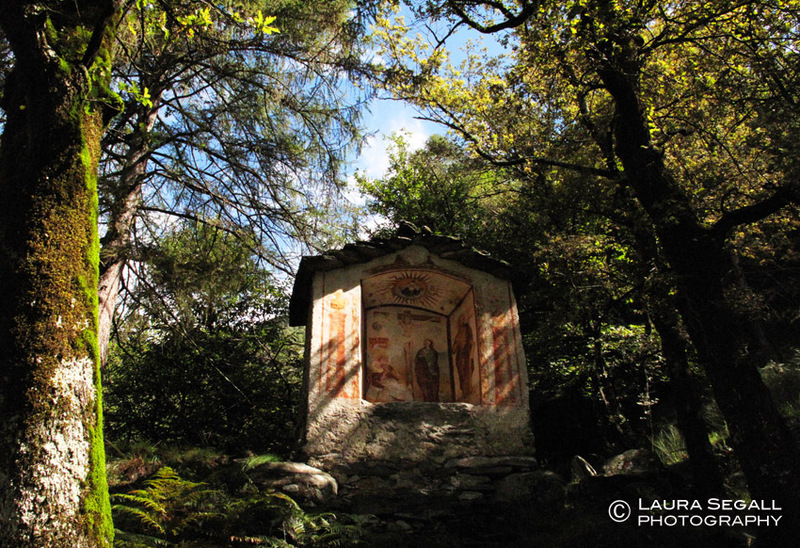 We head into the forest and pass religious shrines and a Swiss cowboy. The Val Piumogna, the main canyon that drains the area comes in from below. There is so much water down there it appears un-runnable as a technical descent. The trail takes us past a small village and more cows. Everything is fresh and earthy. Even the cow manure doesn’t smell bad. The trail climbs higher as white ribbons of water dance down the mountainsides in all directions. We arrive above the tree line into an Alpine world of babbling streams, powerful waterfalls, mellow meadows, near vertical grass covered slopes, rock towers and snow covered mountains. After a short while we can see the Capanna Campo Tencia in the distance. Originally built in 1912 and owned by the Swiss Alpine Club this hut features several bedrooms with dozens of of cots, a bathroom, common area, dining room and a kitchen staffed with a chef that serves up the most delicious regional cuisine. 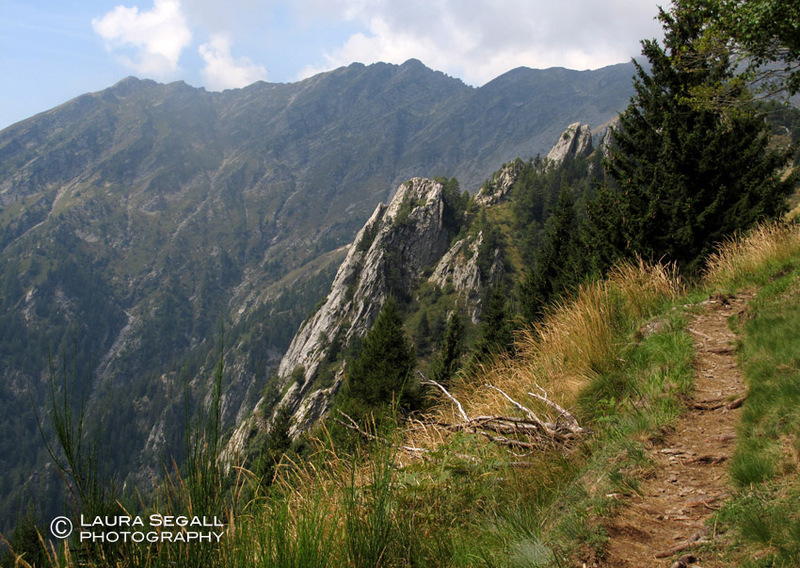 We arrive at the Capanna Campo Tencia, 8.5 miles and over three thousand feet of elevation gain from the trailhead. Breathtaking views are 360 degrees. We meet Franco, the hut master. He is an elite alpine mountaineer having been part of expeditions from the Himalayas to Patagonia. He is short, slight of build, is bald and has a mustache. He whistles the same catchy tune over and over again while preparing food in the kitchen with his partner, Nami. The quiet, small Nepalese man has shared many alpine adventures with Franco during the course of their 20- year friendship. Photos of Franco and Nami atop of some of the most challenging peaks from around the world hang throughout the hut. Nami spends his summers in Switzerland working with Franco at the Capanna Campo Tencia. We are lucky to have them as hosts, especially for their culinary skills. Franco gives us some suggestions of hikes in the area. With his advice that afternoon we walk to the Lago di Morghirolo, just below the ridge line that separates the Valle Maggia (the same one we were canyoneering earlier in the week) and Valle Leventina (an upper branch valley of the Riveiera where we were canyoneering the previous day). Our high altitude position gives us a great perspective of the geography of Ticino and the earth and water that feeds the canyons below. Eric and I take a short and frigid dip in the lake. Laura and I head back to the hut where we rest in our bunk beds and stare out of the panoramic windows. That evening with Franco and Nami in the kitchen, dinner is very special: minestrone soup, fresh salad, braised rosemary beef and pollenta with gravy. We share the dining room with several other small parties of hikers. Two young Swiss Dads wanted to get a quick hike and a tasty meal in before picking up their kids from school. I have to excuse myself several times during the dinner to run outside to the deck to photograph the glowing mountains at sunset. After an early morning breakfast we venture out to tackle the summit of Pizzo Campo Tencia, the highest peak of the area at 3,072 meters (10,079 ft). Franco assures us the climb is non-technical that requires just a little use of the hands for some of the more tricky spots. The trail switchbacks through jagged rocks and climbs up steep slopes of grass that one would never be able to gain traction on were in not for the path. We climb higher with great views of the Capanna Campo Tencia below. We reach a tiny glacial lake at the bottom of a small glacier clinging to what remains of its life. Nami would later tell us that in the 20- years he has been summering at the Capanna Campo Tencia it has been frightening how much the glacier has diminished. We climb an exposed ridge and then skirt above the edge of the glacier to a rock strewn face that takes us to another ridge which takes us to the summit. 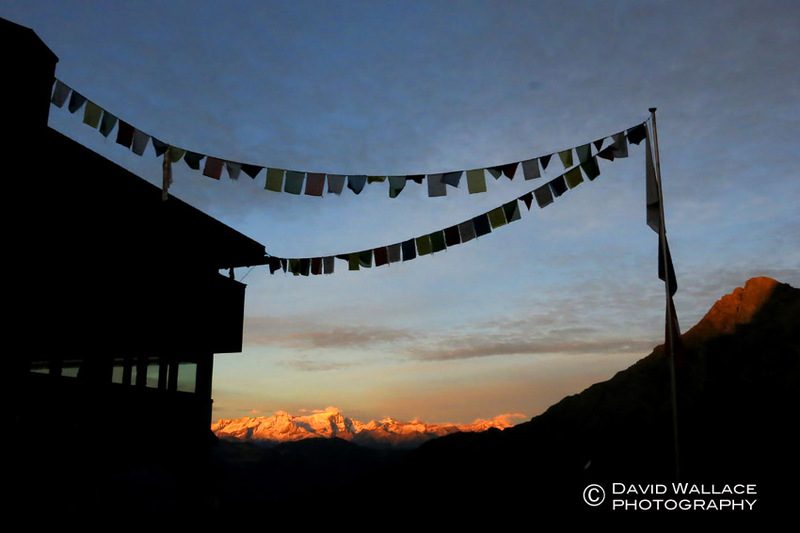 Tibetan prayer flags and giant cairns adorn the summit. After a short break we carefully and slowly make our way back down to the Capanna Campo Tencia. We say goodbye to Nami and Franco, gather our belongings and head back down the trail to our vehicle. We take a slightly different variation of the end of the hike walking through the larger mountain village of Dalpe as opposed to skirting around it. The trail ends in an alleyway between two buildings in Dalpe with what otherwise appears to be a road sign thats says “Capana Campo Tencia – 3.5 ore” referring to a three and a half hour walk to the hut. Hiking is definitively more part of the culture here. For information and reservations for the Capana Campo Tencia click here. 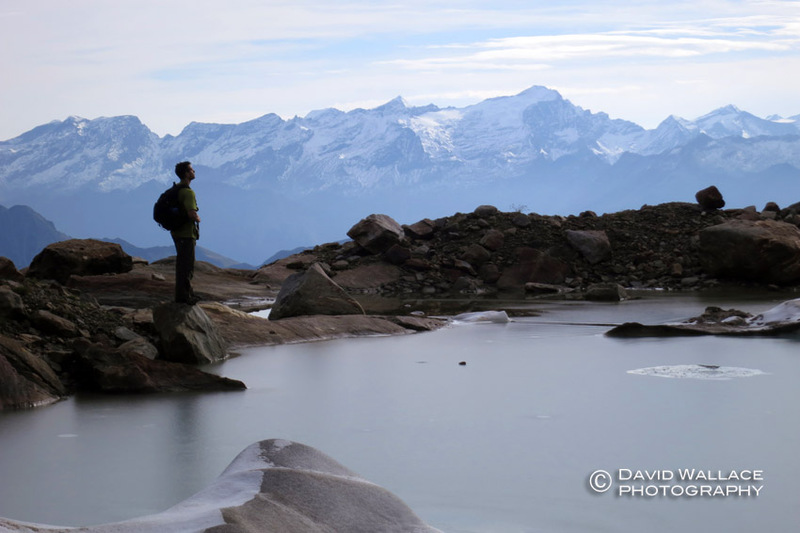 David is seen high in the mountains looking over the Valle Leventina. David and Eric hike through a meadow. The Lago di Morghirolo, high in the alpine. Eric and David prepare for a chilly dip in the Lago di Morghirolo. Snow covered mountains are seen on the other side of the Valle Leventina and Valle di Blenio. The Capanna Campo Tencia, the high alpine hut we stayed in overnight. (At left) David poses for a photo with Nami. Franco, (at right) the hut master. Laura and Eric eat breakfast in the Capanna Campo Tencia. Eric on the hike up to the summit of Pizzo Campo Tencia. The Capanna Campo Tencia can be seen below as we hike to the summit of Pizzo Campo Tencia. Eric is seen alongside a small glacial lake on the hike to Pizzo Campo Tencia. Laura and David on the summit of Pizzo Campo Tencia, at 3,072 meters (10,079 ft). Leaving the Capanna Campo Tencia. Laura hikes through the forest into the Val Piumogna on the hike out.